My granola-loving brother-in-law is here for the weekend, so I felt inspired to pull out my favorite recipe and bake up some crunchy oatmeal goodness. Several years ago our friend Lace served us the best granola I’d ever had: a Williams-Sonoma recipe called Honey Granola. I’ve tweaked it a bit and am quite happy with the result, especially the texture and caramel flavor of the cherries after they’re baked. It really takes no time at all to make a healthy homemade breakfast. 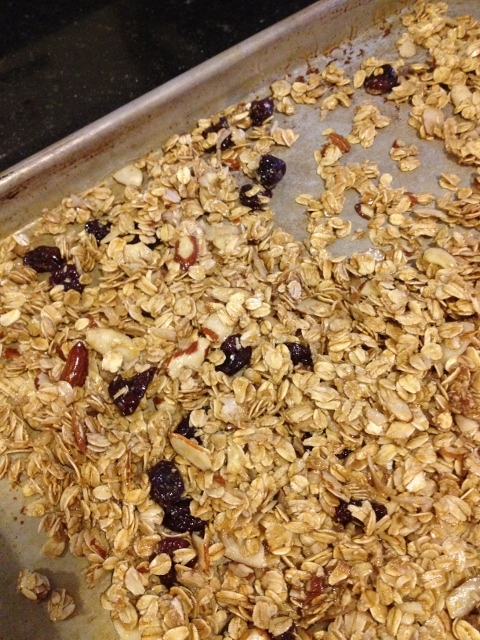 In a bowl, stir together oats, brown sugar, cinnamon, coconut, cherries, and almonds. Combine Earth Balance and maple syrup in a small saucepan; heat over low until melted. Pour over oat mixture and stir until well coated. Spread out on baking sheet. Total baking time is 25 minutes; I like to stir it about halfway through. 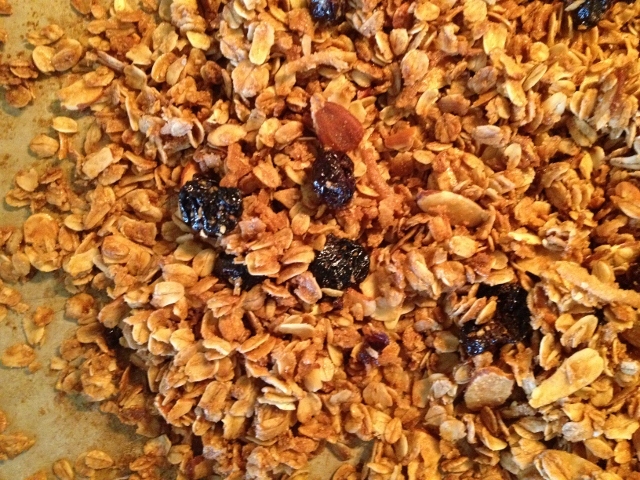 Adapted from Williams-Sonoma's Honey Granola. Another note on portion size: the bowl makes a big difference. If you’re used to regular cold cereals that are all airy and puffed up, you probably grab a soup bowl in the morning and fill it with a couple cups or more. When you put 1/3 cup of granola in that same bowl it’s going to look very disappointing. Research tells us that we can be satisfied with smaller servings if we choose plates and bowls that make our healthy helping look generous. As they say, we eat with our eyes. 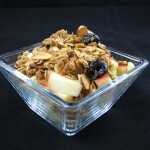 Consider how 1/3 cup of granola atop chopped apple looks in this container. Another benefit to portion control is that you can stretch your recipes further. 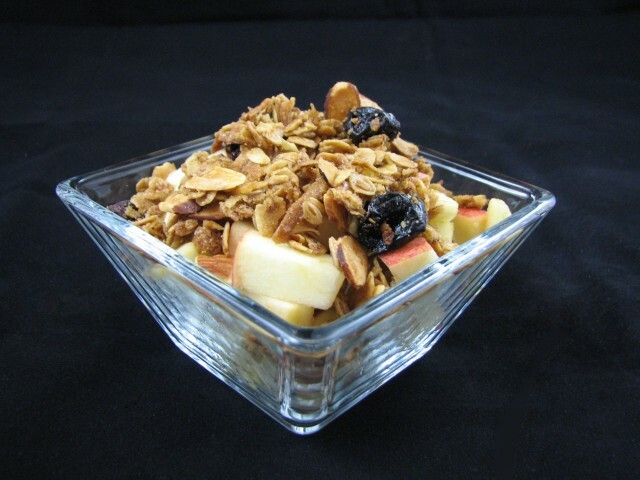 Putting the time in to make granola on the weekend lets you enjoy a healthy breakfast all week long. What tips and tricks do you have for being happy and contented with smaller portions? I love your granola — so…. I’m going to eat more of your granola and less of other stuff! Yum. Do you know about the Vegfest 2012, March 24 & 25, Seattle Center? Looks like a good event. Looks yummy! I’ll have to try it the next time we run out of granola!